TITLE 1. These bye-laws may be cited as the Deal Pier Bye-laws, 1976. APPLICATION 2. These bye-laws shall apply within the limits set out on the map at the end of the bye-laws. COMMENCEMENT AND REPEAL 3. These bye-laws shall come into operation on the expiration of one month from the date of the allowance and confirmation thereof by the Secretary of State for the Environment as from which date the bye-laws made by the Mayor, Aldermen and Burgesses of the Borough of Deal acting by the Council on the 15th day of December, 1959 and the 2nd day of February, 1962, to regulate the use of Deal Pier, are hereby repealed. "The Council" means the Dover District Council. 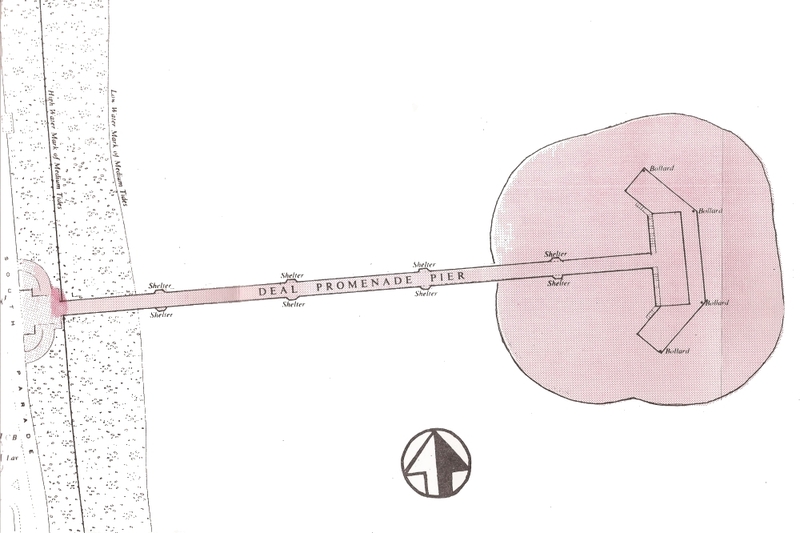 "The Pier" means and includes the Pier known as the Deal Pier together with all works and conveniences now or hereafter connected therewith. "The Pier Master" means the Pier Master and shall include his duly authorised assistants. "The Master" includes any person for the time being in charge of a vessel. "The Summer Season" - In any one year shall be that period from and including the third Monday in July up to and including the Saturday next following the late Summer Public Holiday. "Vessel" includes a ship, boat, lighter, hovercraft (within the meaning of the Hovercraft Act 1968) and craft of any kind whether navigated by steam or otherwise, or any other description of vessel used in navigation. WILFUL OBSTRUCTION 5. A person shall not obstruct the free passage on, to, or from any part of the Pier, or intentionally obstruct or impede any officer or servant of the Council in the execution of his duty in connection with the Pier. IMPORTUNING 6. A person shall not on any part of the Pier importune any other person to be carried for hire or to cause any goods or articles belonging to him to be carried for hire in any boat or vessel or in any carriage, or to be conveyed to, or to lodge in or hire any room or rooms in any Hotel, Motel, Inn, Boarding House or Lodging House. SALE OF ARTICLES OR GOODS 7. No person shall sell, or offer or expose for sale on any part of the Pier any service, commodity or article except with the prior consent in writing of the Council. VEHICLES 8. A person shall not use, drive, or place on any part of the Pier any cart, carriage, barrow, truck, bicycle, velocipede, roller skates, or any other carriage of any sort, unless authorised to do so by the Pier Master and in such circumstances the laden weight limit of such cart, carriage, barrow, truck, bicycle, velocipede or other carriage shall be 30 hundred weight (1524 kilograms). ANIMALS 9. (i) A person shall not use, lead, drive or ride on any part of the Pier any horse, mule or other animal or knowingly cause or permit such animals to be used, lead, driven or ridden on any part of the Pier except with the consent of the Pier Master. 9. (ii) No person shall bring a dog, cat or other domestic animal on to the Pier provided that this bye-law shall not apply to a blind person accompanied by a guide dog. Note: By operation of section 70 of the Anti-social Behaviour, Crime and Policing Act 2014, bye-law 9 (ii) is of no effect in relation to Deal Pier during the three year term of the Dover District Council PSPO dated 28th July 2018. CLOSING OF THE PIER 10. (i) In every case where by notice or notices affixed or set up in a suitable or conspicuous position at or near to the entrance to the Pier the Council shall declare that the Pier is closed for a period to be specified in such a notice or notices a person other than a person duly authorised by the Council shall not be entitled to admission to the Pier and shall not enter thereon except upon the terms of admission which may be prescribed in such notice or notices. 10. (ii) In every case where the Council shall rail or fence off certain areas of the Pier for the purpose of maintenance or in respect of structural damage no person shall enter the said areas unless duly authorised by the Council. CLOSING THE MAIN LANDING DECK 11. (i) In every case where by notice affixed or set up in some suitable or conspicuous position at or near to the entrance to the Pier and on the stair-ways leading from the promenade deck to the main landing deck the Council shall make known that the main landing deck is closed to persons other than those who are embarking or landing from vessels resorting to the Pier a person other than a person duly authorised by the Council shall not remain upon or gain access to the main landing deck unless he is in possession of such documents as entitle him to embark upon or land from a vessel resorting to the Pier. 11. (ii) During periods of rough weather no person shall enter on, gain access to, or remain on the main landing deck. ADMISSION TO BAND CONCERTS AND OTHER PERFORMANCES 12. In every case where the Council shall rail or fence off certain areas of the Pier for the purpose of Band, Concert, Dancing or other performances of a like nature a person shall not enter the said areas after due notice from the Pier Master except upon payment of the sum charged for admission to such performances. (b) By night, when six white lights are displayed in a vertical position. STEAM VESSELS 14. (i) The Master or owner of a steam vessel lying alongside the Pier shall cause steam to be kept up in such vessel. 14. (ii) The Master of a vessel shall not cause or permit coal to be received while the Vessel is lying alongside the Pier. 14. (iii) The Master of a Vessel shall not cause or permit fires to be stoked on any vessel so as to cause smoke while the vessel is lying alongside the Pier. MEANS OF LANDING FROM VESSELS 15. (i) The Master and/or Owner of every vessel berthed at the Pier shall ensure that a proper and efficient gangway is provided between the vessel and the Pier. Such gangway shall be provided with adequate hand rails and safety nets. 15. (ii) The Master and/or Owner of every vessel berthed at the Pier shall during the embarkation and disembarkation of passengers instruct at least one crew member to supervise each gangway in use so as to ensure safe access to and egress from the vessel. 15. (iii) Notwithstanding Bye-law 15 (ii) hereof the Master and/or Owner of every vessel berthed at the Pier shall during the hours of darkness when normal lighting is inadequate ensure that adequate illumination is provided for the safe passage of passengers between the vessel and the Pier. FENDERS FOR VESSELS 16. The Master or Owner of every vessel approaching or mooring to the Pier shall cause to be used sufficient fenders or rubbers so as not to injure the Pier. BATHING FROM THE PIER 17. A person shall not bathe or attempt to bathe in the sea from any part of the Pier without the consent of the Council. RELIGIOUS AND OTHER MEETINGS 18. A person shall not without the prior consent of the Council in writing preach or address any assembly or give any lectures or hold any meeting on the Pier or any part thereof. THROWING STONES ETC. 19. A person shall not discharge any stone, stick or other missile on the Pier. PLAYING MUSICAL INSTRUMENTS 20. No person shall operate or cause to suffer to be operated upon the Pier any radio receiver between the hours of midnight and 6 a.m. and no person shall operate or cause or suffer to be operated upon the Pier any radio receiver, wireless set, gramophone, amplifier or similar instrument or any musical instrument at any other time in a manner which makes or causes or suffers to be made any noise which is so loud or continuous or repeated as to give reasonable cause for annoyance to other persons upon the Pier. FISHING 21. (i) A person shall not at any time fish or use any rod line net or other means of catching fish except from such parts of the Pier as the Pier Master shall from time to time direct. 21. (ii) A person participating in organised fishing competitions shall not fish or use any rod line net or other means of catching fish otherwise than from such numbered positions on the promenade deck to which he is directed by the Pier Master. 21. (iii) A person shall not at any time use a drop net, tripod or longline from the promenade deck. 21. (iv) A person shall not use a rod or other means of catching fish from the North side of the promenade deck during the period of the "summer season". FOULING THE PIER 22. (i) A person shall not place on any seats, deck chairs, or buildings, on the Pier any bait or fish. 22. (ii) Every person using the Pier for the purpose of fishing shall, before leaving, remove any materials, items, or associated matters brought by him onto the Pier and used by him for the purpose of fishing. MUSSELS AND SHELL FISH 23. No person shall remove or detach from any part of the Pier any mussel or shell fish. IMPEDING PASSAGE OF VESSELS 24. No person shall in any way impede the passage of vessels under and through those parts of the Pier identified by yellow painted hand rails. OFFENCES AND PENALTIES 25. A person who without reasonable excuse offends against any of the foregoing bye-laws shall be liable for every such offence to a penalty not exceeding two pounds.